The Career Center has partnered with other Boise State departments and the Idaho Digital Learning Academy (IDLA) to offer a concurrent enrollment version of our ACAD 108: Career and Life Planning class. Students anywhere in the state may register for this online, 2-credit concurrent enrollment course through IDLA and Boise State. Learn more about how the Career and Life Planning class can help you get the career planning assistance you need to make good decisions about your future. The Career Center has a variety of content and materials for classroom and advising/counseling settings, which we are able to share with you upon request. We have interactive eLearning modules, videos, customizable curriculum, and web resources available. Contact our Assistant Director of Educational Outreach, Jennifer Iuvone, at jenniferiuvone@boisestate.edu for more information. 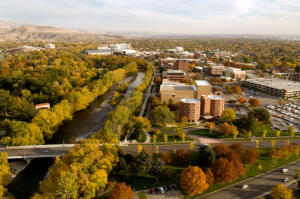 The Career Center at Boise State exists to serve Boise State students and alumni; therefore, community members are not eligible for the majority of our in-person services. However, community members are welcome to utilize the self-guided resources in our Virtual Career Center. Need career planning or job search assistance? View a list of other community resources and career transition tips on our Community Resources handout (Word document). Want to help current Boise State students in their career development? Learn more about BroncoLink, our alumni mentor program.